The African Union has condemned a coup in Niger, where soldiers detained President Mamadou Tandja after gun battles in the capital, Niamey. Former colonial power France has also criticised the coup and West African bloc Ecowas has sent a team to talk to the plotters, led by Col Salou Djibo. But one opposition activist told the BBC the soldiers were "honest patriots" who were fighting tyranny. State TV reported that Mr Tandja was "safe" but did not say where he was. Mr Tandja provoked a political crisis last August when he changed the constitution of the uranium-rich country to allow him to remain in power indefinitely. "France condemns the taking of power by non-constitutional means," French foreign ministry spokesman Bernard Valero said. AU chief Jean Ping said he was watching developments "with concern". 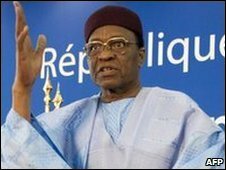 The Economic Community Of West African States (Ecowas), which suspended Niger after Mr Tandja's actions, said it had "zero tolerance" for any unconstitutional changes of government. "We condemn the coup d'etat just as we condemn the constitutional coup d'etat by Tandja," Ecowas official Abdel Fatau Musa told the BBC's Network Africa programme. He said the group had already sent a team to Niger and would maintain sanctions "until constitutional order is restored". The BBC's Idy Baraou in the capital, Niamey, says 10 people, including four soldiers, died in the coup. The morning after the gun battles, people in the city were going to mosques and shops as normal. There was not an obvious military presence on the streets, but heavy artillery had been deployed around the presidential palace, our correspondent added. In a televised address on Thursday evening, a spokesman for the plotters announced that the constitution had been suspended and all state institutions dissolved. The junta, which has called itself the Supreme Council for the Restoration of Democracy, imposed a curfew and closed the country's borders - measures that were lifted on Friday. The plotters said their aim was to restore democracy and save the population from "poverty, deception and corruption". Col Djibo is commander of "military zone 1", which includes Niamey, Dosso and Tillaberi regions. Analysts say his position puts him in control of 40% of the country's military arsenal. 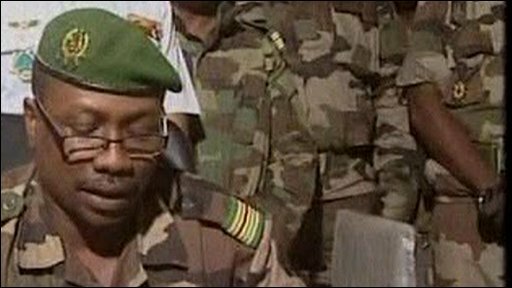 Another of the plotters, Col Djibrilla Hima Hamidou, was junta spokesman during the last military takeover in 1999. The president was assassinated during that coup, but civilian rule was restored within a year. One opposition activist, Mahamadou Karijo, whose Party for Democracy and Socialism has been bitterly opposed to Mr Tandja's rule, praised the soldiers for fighting tyranny. "They behave like they say - they are not interested in political leadership, they will fight to save the Nigerien people from any kind of tyranny," he told Network Africa. The government and opposition had been holding on-off talks since December to try to resolve the country's political crisis. Mr Tandja, a former army officer, was first voted into office in 1999 and was returned to power in an election in 2004. The 71-year-old leader was grabbed by soldiers while he chaired his weekly cabinet meeting. The junta issued a communique on Friday saying government departments would now be run by senior civil servants. It is thought that the soldiers are holding the cabinet ministers, although no mention has been made of their fates. It is one of the world's poorest countries, but Mr Tandja's supporters argue that his decade in power has brought a measure of economic stability. Under his tenure, the French energy firm Areva has begun work on the world's second-biggest uranium mine - ploughing an estimated $1.5bn (£970m) into the project. China National Petroleum Corporation signed a $5bn deal in 2008 to pump oil within three years.